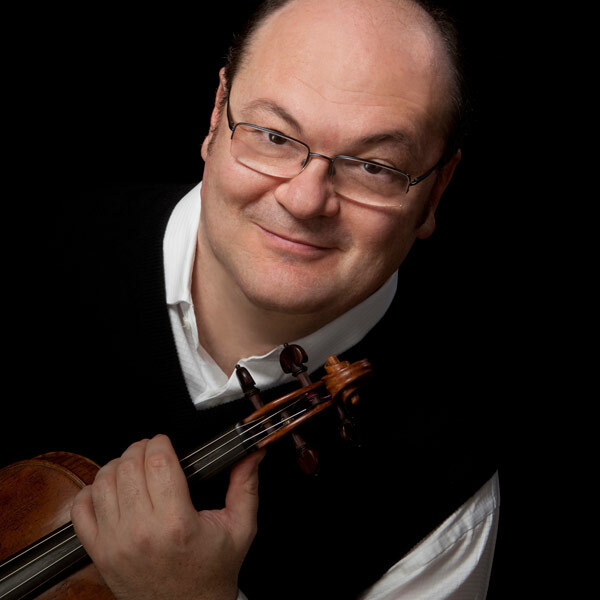 Praised for “sophisticated, warm intensity, radiant timbre and well-balanced, harmonious performance style” (‘Sulzbach-Rosenberg”, Germany) violinist Arik Braude has performed as a soloist with orchestras in the U.S., Europe and Asia. His recent performances of concertos by Bach, Haydn and Mendelssohn (double) with the JVNY camerata in repeated appearances at New York’s Bargemusic as well as in Geneva (Switzerland) and throughout France brought audiences to its feet. Mr. Braude has also appeared as soloist with the Bangkok Symphony Orchestra, the Israeli Sinfonietta, the Belgorod Symphony Orchestra (Russia), the Antwerp Chamber Orchestra (Belgium), and numerous festival orchestras, including the International Master Players (Switzerland), the Yehudi Menuhin Festival Orchestra (Switzerland), and the Minsk Orchestra of Belo Russia (Fetes musicales de Savoie, France). An avid chamber musician Mr. Braude has appeared at Music@Menlo (CA), Bargemusic (NY), Mainz Kammerorchester chamber music series (Germany), Festival des Arcs (France), Fetes musicales de Savoie (France), Sulzbach-Rosenberg International Music Festival (Germany), Musicales Internationales (France), Killington Chamber Music Festival (VT), Green Mountain Chamber Music Festival (VT), as well numerous concert series in Belgium, France and Italy. He has recorded for Music@Menlo, Talent Cassics and Le Chant de Linos labels and has performed on France 3 and Belgium Radio/TV. Mr. Braude was deeply inspired by his father and first violin teacher, the late Nathan V. Braude, a well-known violin professor in the Soviet Union and a student of the legendary Abram Yampolsky. Arik Braude dedicated much of his energies to pedagogy and has been instrumental in raising a number of brilliant young professional musicians in New York city. Mr. Braude’s students have appeared as soloists with orchestras in the U.S., France and Germany, including the New York Philharmonic and the Little Orchestra Society (NYC). They have been given opportunities to collaborate with some of the leading chamber musicians in New York City and have won numerous competitions, including From the Top. His students have served as concertmaster of the New York Youth Symphony, and have performed in all the major concert halls in New York city. Along with his wife Sophie Arbuckle, and in collaboration with French harpsichordist, Georges Kiss, Mr. Braude founded Jeunes Virtuoses de New York (JVNY, inc.) in 2008, a vibrant ensemble of young musicians at the onset of their careers, most of whom have been students of Mr. Braude for over a decade, and who are leading versatile musical careers in New York and abroad. Mr. Braude currently serves on the jury panel of the Brahms International competition in Austria. He is a violin faculty at the Aaron Copland Conservatory of Music at Queens College (CUNY) and the Mannes College of Music preparatory division. He currently serves on the jury panel of the Johannes Brahms Competition in Portschach, Austria. He is the artistic director of JVNY, inc. and of the JVNY chamber music workshop in Courchevel, France. He has directed the Young Artist program at the Music@Menlo festival (CA) and has served as artist faculty at the Festival des Arcs (France), the Killington Music Festival (VT), the Green Mountain Chamber Music Festival (VT) and the Interharmony Music Festival (Germany). He has given master classes in France, Germany, Portugal, Italy, England and the US. He has been featured in an interview about his teaching for the British magazine The Strad, and has contributed to the magazine’s Ask the Experts column. Mr. Braude began his violin studies in the special music school in Kazan (Russia) with his father Nathan V. Braude. He later continued his studies with David Oistrach’s assistant, Piotr Bondorenko and Felix Andrievsky in Israel, with Jens Ellermann in Hannover, Germany, with Ifrah Neeman in London and with Sally Thomas in New York. He has performed in master classes for Isaac Stern and Alexander Schneider at the Jerusalem Music Center (Israel), and Ruggiero Ricci at the Yehudi Menuhin International Music Festival in Gstaad (Switzerland). Mr. Braude’s violin was made by Genarro Gagliano in Napoli, Italy in 1756. "KMF has been a wonderful learning experience for me. The passionate and nurturing faculty have ensured that every student comes away from KMF feeling inspired and encouraged."